The animation film Bay of Plenty describes the journey of discovery of a fictional, virtual island world. By means of a first-person camera perspective, the audience engages with and becomes part of the events. They encounter creatures who transcend categories such as male/female, artificial/natural, animal/human and who are constantly changing the form of their bodies. Together, they explore possibilities of overcoming their physical boundaries and learn how to create new (life) conditions. A virtual island platform is the setting, its inhabitants and some plant-like objects are the characters of Milva Stutz’s animation film. Ocean and island are characterized by an artificial smoothness, while all living creatures have a sculptural body. The characters are made of orange Plasticine and show traces of manual fabrication; in some camera settings, one can even see fingerprints. In four scenes set on different parts of the island, the “lilits”, as Stutz calls her naked characters, act out rituals of (self-) discovery, of making contact and of encounter. While the “lilits” merely have female sexual characteristics in the beginning, they turn out to be sexual beings whose body language and gestures make them curious, experience-seeking and reflective subjects during the course of the movie. Their ability to transform their bodies, to change their sexual identities and create new, temporary forms, leads to slapstick-like situations. Early, rather clumsy attempts to communicate with the island’s plants are followed by increasingly intense body fusions and transformations, until, towards the end of the movie, one of the “lilits” expands her body significantly and transforms into a viscous, swirling mass. The bronze coating overlays the ocean’s surface, before spreading out virally into the universe. 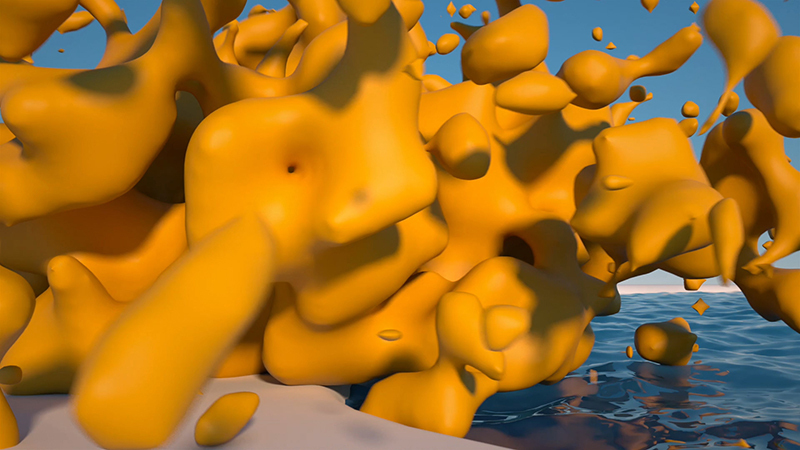 What Milva Stutz creates in her animation film is not an island of bliss. In fact, the seemingly paradisiac primal state of the little island community harbors substantial challenges and difficult decision processes. In what state of fluid identity that eludes clear attribution should they remain? How can they recognize one another when physical boundaries and biological differences can be changed, when the mere thought of (self-) optimization has an immediate physical “effect”? It is not by chance that the mutable beings’ features remain impassive, rather laconic. They virtually surrender to the fascination with their abilities and physicality, follow the urge for change, reinvention and the dissolution of boundaries. It cannot be excluded that the “lilits” will be denied a return to a concrete representation of the physical. The end of the film, however, rather indicates a cycle potentially repeating at different places, at different times. The dichotomous layout of characters and actions and their formal correspondence make it evident that Milva Stutz picks up on queer theory approaches. Not by chance, Bay of Plenty seems to be a feminist update of the great Christian genesis story: the creator’s attitude, strongly manifest in the kneaded creatures, the moment of knowing someone, in the literal and the biblical sense, the (presumably) irreversible transformation of the world as a consequence of the (physical) boundary crossing - all these aspects give the animation film the character of a (social) vision, despite or even because of its medial realization and the semantics that go along with it: enveloped in spherical sound, the “lilits” test their physical potential, explore options of a physical dissolution of boundaries and gradually learn how to create (new) living conditions. Milva Stutz (*1985 in Zurich) studied illustration, fiction and art mediation at the Lucerne School of Art and Design (HSLU), at Edinburgh College of Art and at ZHdK, Zurich University of the Arts. Currently she is studying for a Master of Fine Arts at ZHdK. Milva Stutz works mainly with drawing, installation and animation film, dealing with the relation between body, space and power structures. Her work has been shown internationally in various contexts. Since 2013 she has been lecturer in drawing at the preparatory course of ZHdK, and since 2012 she has been co-publisher of Strapazin Magazin.